Inspired by the classic Marina link style from Italy, this tungsten carbide bracelet features the Marina links that are connected at a right angle to the adjacent link. 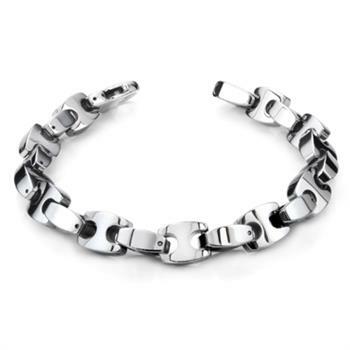 All links are finish to the highest gloss mirror finish, and since these links are crafted from solid tungsten carbide, it they will never scratch or tarnish. Although this is the bulkiest bracelet we offer, it is very flexible and wraps around your wrist comfortably. The flexible structure is made possible by our specially designed pins that hold the links together, they are carefully engineered to last, for daily wear by people with active lifestyle. You can have confidence that the bracelet is not going to scratch, tarnish or break whether you are in the gym or the ocean. The 8.5" version of this bracelet weighs approximately 106 grams.